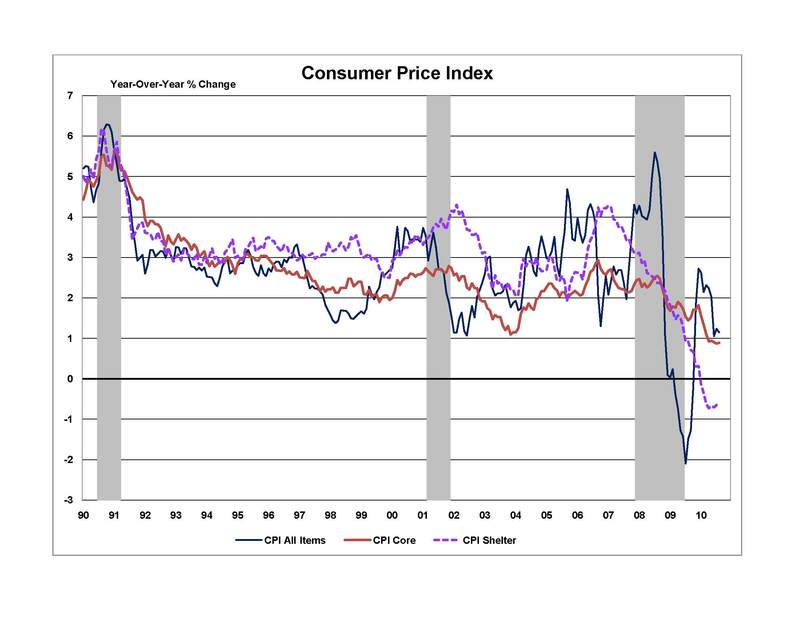 The rate of increase in the Consumer Price Index (CPI) remained very low in September. The Bureau of Labor Statistics release of the Consumer Price Index indicates that the CPI for all urban consumers (CPI-U) rose only 0.1% in September, following a 0.3% increase in August. Over the past 12 months the index has increased 1.1%. Increases in the price of food and gasoline contributed to the monthly increase. The food index rose 0.2% in September, following a 0.3% rise in August. The energy index rose 0.7% in September, after a 2.3% increase in August. The increase in the energy index was driven by a 1.6% increase in gasoline prices. Household energy prices fell 0.6% in September with a reduction in gas and electricity prices. Year-over-year, the food index is up 1.4%, while the energy index is up 3.8%. Core CPI, all items less food and energy, was again flat, showing zero growth in both August and September. Over the past 12 months core CPI has grown a meager 0.8%, the lowest annual increase since March of 1961. The shelter index was unchanged for the second month in a row. The owners’ equivalent rent component also remained at the same level for the second consecutive month. While the rent index rose 0.1%, this was offset by a 0.2% fall in the lodging away from home index. With high vacancy rates in both the owner occupied and rental markets, the shelter index has shown little change for much of 2010. Year-over-year, the shelter index has decreased 0.4%. The shelter index is a large component of the CPI, representing 31% of its total value. Slow growth in rent and rent equivalents has been a major factor in the slow growth of the CPI over the past year. The low rate of inflation has the Federal Reserve Bank concerned about the possibility of deflation, an outcome we see as still unlikely. A weak housing market and high vacancy rates are likely to keep the shelter index on its current path, flat to slightly down, over the next 12 months. Food prices are likely be volatile, with recent announcements of grain poor harvests in the United States and lower production in several other major exporting countries. Energy prices are expected to remain relatively stable due to weak economic growth in major industrial economies slowing energy demand, despite robust economic growth in the developing world. Overall, we expect the CPI-U to remain around its current level of 1.1% annual rate through the remainder of 2010 and through 2011.